In case of dental emergencies, it is always better to be safe than sorry, as seemingly trivial injuries can escalate very quickly. Whether it is a chipped tooth, gum injury or other such dental problems at very odd hours of the day; waiting till the clinics open may not always be a feasible option. Emergency dentists and dental clinics are the answer to your prayers when it comes to such critical situations, as they remain open 24/7 just to cater to your immediate needs. Besides, emergency dentists are also a blessing to those who cannot visit a normal dentist during the weekdays due to full-time jobs clogging up their schedule. Since normal clinics do not usually remain operational during weekends, emergency dentists are the best place to go to. In the early 1950’s, Costa Mesa used to be a semi-rural farming community. However, this beautiful city in Orange County,California, is now a bustling edge city of 109,960 residents and an ever-growing economy based on light manufacturing works, commerce, and retail. In a busy city populated as such, services, such as emergency dentistry, is highly prized. Therefore, those who live here need to keep some contact information of Los Angeles emergency dentists. 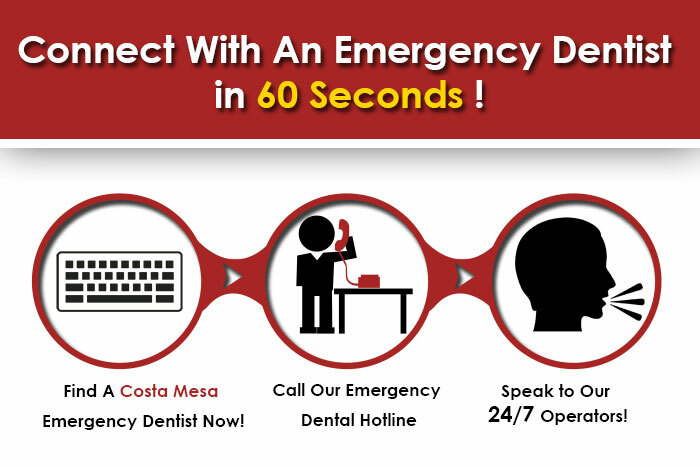 The following is a list of emergency dentists and dental clinics for the residents of Costa Mesa. Dr. Michael Ayzin’s dental practice is what can be termed as dentistry that goes above and beyond the call of duty. Promising a pain free experience, the clinic has a full scope of cosmetic and general dentistry ranging from porcelain veneers, Invisalign orthodontics, pain free laser dentistry to complete smile makeovers. Located at 1202 Bristol St Suite, they can be contacted at 714-540-5511. Dr. Inna Bosh’s friendly clinic is a full service cosmetic and oral surgery practice that gives prompt attention to dental emergencies. They take pride in providing special care for individuals, senior citizens, and families alike, with treatment plans tailor made to suit each patient’s needs. Located at 660 Baker St #117, you can call their number,714-540-8000, today if you have an emergency. Bright Now! Dental has Dr. Nora Kahenasa in the Oral and Maxillofacial Surgery department and Dr. TuanTuan Ly at their Pediatric Dentistry department among others.The clinic has great reviews all over the internet, signifying that their service is admired by many residents of Costa Mesa. The location of this clinic is 2300 Harbor Blvd #5. You can call at 949-610-0146to book an appointment. If you are looking for a dentist in La Mirada, California. Click here!